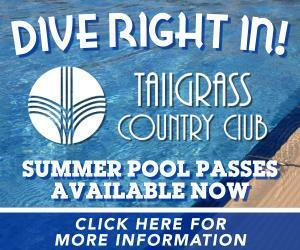 Cool off at Tallgrass Country Club this summer by purchasing a Summer Swim Pass! Our pool opens May 24th and remains open until September 2nd. Pool Hours: 12 pm-8 pm everyday. $375 per family - includes unlimited family access to the pool from May 24th-September 2nd. Daily guest fees: $4 per person (weekdays), $7 per person (weekends) without a swim pass. Daily guest fees: $10 per family (weekdays), $15 per family (weekends). Swimmers will be divided into two different categories, Juniors (10 and under) and Seniors (11-18). Junior's practice begins on May 28th at 8:30-9:30 am, Monday-Friday. Junior meets will be on Saturdays in June, and will begin June 8th. Meets begin at 9 am and the locations are TBD. Senior's practice begins on May 28th at 9:30-11 am, Monday-Friday. Senior meets will be on Wednesday evenings in June, and will begin June 5th. Meets begin at 6:30 pm and the locations are TBD. The end of the year banquet is scheduled for June 21st at 6 pm. Sign Up for the Swim Team! To schedule an event at the pool please reach out to Tina Brown, tina.brown@greatlifegolf.com.